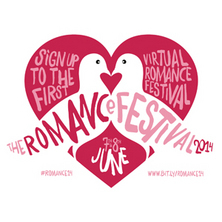 HarperCollins UK’s June virtual Romance Festival was a success; in August SF publisher Gollancz hosted a festival combining online Q&As with real life events. Read my latest headline story for New York based Publishing Perspectives in full below or by clicking on this link. ‘It was a risk as to how the virtual festival book would be perceived by fans, authors and publishers,’ admits Sam Missingham, the new head of events at HarperCollins Publishing and the driving force behind the first-ever virtual Romance Festival, a two-day event that was held in cyberspace this past June. While most book festivals have an online presence, a virtual festival takes this a couple of steps further to the point where all talks, Q&As and chats between authors and readers take place online, via social media including Facebook, Twitter, and Pinterest, as well group video chats on Google Hangouts and Goodreads’ Ask the Author platform. It was a global event too, says Missingham, as a third of the authors were not from the UK and, often, were physically on the other side of the world. Yet, because of the online nature of the festival, they could still take part — even if it meant staying up into the early hours of the morning in some cases. 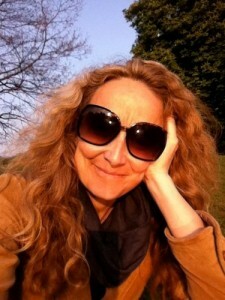 One author even took part in a Google Hangout from a writer’s retreat in New York. The challenge was to select the right platform for each event. “Facebook as a platform worked much better than Twitter for author Q&A because you could scroll down and see the conversation. Some author stuff worked better on Twitter, such as Script Doctor,” says Missingham. Despite its virtual nature, she admits that it did become a ‘huge resource drain,’ involving all personnel in the marketing department as well as graduate trainees. Some of the platforms, such as WordPress, proved limited in terms of interactivity. By the end of the festival, the organizers had a set of vital statistics that include the 120 participating authors’ potential global reach, some 17.9 million timelines on Twitter and 75,000 people on Facebook. Eighty-five percent of those readers who replied to a questionnaire said they found out about new authors and new books as a result of the festival. Missingham is already planning festivals in new genres for next year. The “inclusive” nature of the online world is also being carried over into the physical world with the “affordable” £6 ticket and a goodie bag. The key issue – and this still exists for Q&As on other social media – is that once the event is over, the answers tend to get lost as they get buried under all the other new information coming through. So Ask the Author, launched in May on Goodreads, “brings that Q&A experience front and center on the author’s page so that it’s easy to discover and share with your Goodreads friends. 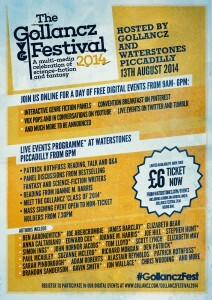 According to a spokesperson for Waterstones, UK’s largest bookshop chain and key partner of the Gollancz Festival, virtual festivals are no threat to their stores as “any opportunity to talk about books, be it online or face to face, is a good thing. We at Waterstones love to invite readers into our shops to meet authors but we also stream events online, Skype and host twinterviews, to help authors engage with their fans and reach more people than before. The Gollancz team are already on the lookout for the “amazing new platforms that will emerge between now and next year,” says McMenemy. In future it is hoped that the physical festival will actually move round Britain.